Whitefish Lake home in the process of being completely renovated with high-quality finishes. Spacious, 4 BR/4BA home will have fully finished walkout low. lev. 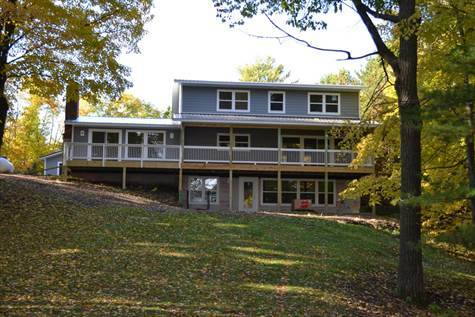 South facing home has 120 ft of level lake frontage w/sugar, sand bottom. Spacious, open kitchen w/granite counter tops & stainless steel appliances. Main floor master w/beautiful lake view will feature a fireplace and walk-in closet. Quality hardwood floors throughout main level w/spacious living room, fireplace and laundry room. Walkout lower level will include space for generous family room as well as lakeside bedroom w/fireplace & full bath. As well as large covered deck and patio for entertaining. Attractive exterior has beautiful stone & composite materials and over sized 2 car garage. Premiere lake location includes excellent fishing, recreation and active restaurant. Handicap accessible. Conveniently located minutes from Hayward & only 2.5 hrs from Minneapolis.